After a last breakfast with her parents on a frozen coast, a young Adélie penguin spends a long summer feeding in the cold ocean, followed by an even longer dark winter resting on the ice until the sun rises the following spring. This lovely follow-up to In the Savannah (2015) continues a promising series introducing ecosystems to very young readers and listeners. The gentle story is set directly on full- and double-page spreads filled with black, white, and gray animal life and the blue of the ocean water. When the young penguin takes off into the ocean for the first time, the curves of the displaced water and the penguins' backs emphasize the birds' grace in their underwater world. Among the many animals on each page, this chick is clearly identifiable by her blue eyes and tuft of baby fluff, which sharp-eyed readers will see her losing on the next-to-last spread. Among the many very similar penguins the two splotches of brown on her back and tail will also help readers find her. 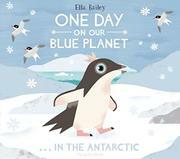 Thoughtful design includes endpapers identifying the various Antarctic creatures that can be found on the pages and an Antarctic-centered globe on the title page.